Lewis Hamilton prevailed from the Malaysian Grand Prix Qualifying to grab pole position in the race. 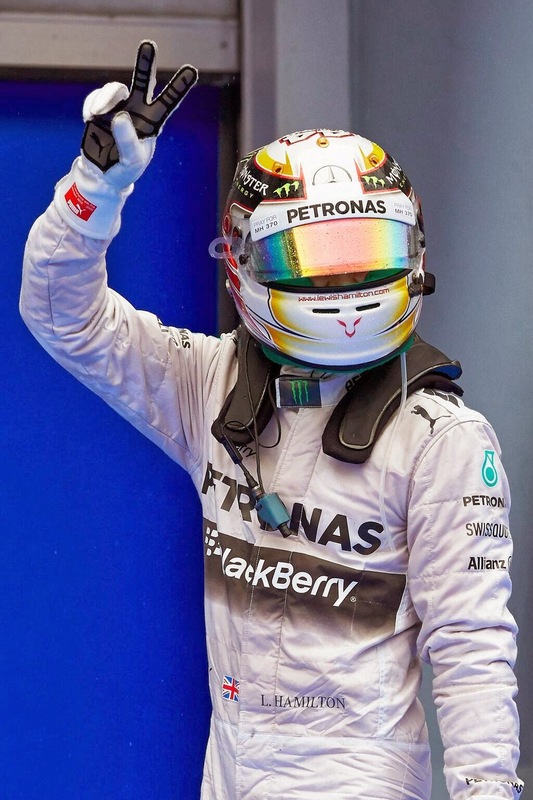 Formula 1 is all about fine margins, and fine it was as Lewis Hamilton just shaded Sebastian Vettel to grab his 33rd career pole position equalling Jim Clark`s record. The rain in Malaysia falls mainly... at the Sepang Circuit! With 50 mins until Qualy start the heavens opened and Qualy was delayed by 50 minutes. At the start of Q1 the two Mercedes AMG drivers come out first to set a lap time in uncertain conditions. As Q1 progresses Nico Rosberg sets a fastest time of 1:57.183 before Marcus Ericsson crashes and the session is red flagged. Q2 starts with most drivers opting to go out early with intermediate tyres. Ferrari have a disaster when Alonso clashes with Kvyat at turn 9 and a red flag is shown! A result of poor visibility and poor judgement by both drivers, no penalty applied. Alonso suffers a broken upper wishbone suspension failure which is soon fixed by the Ferrari mechanics in time for Q3. Drivers through to Q3 were Ham,Vet,Ros,Ric,Hul,Alo,Rai,But,Mag and Ver! Q3 starts with most of the drivers coming out on track in wet conditions still. Full wets or Inters the only major decision to make now! Lewis Hamilto sets the pace early on with a time of 1:59,431 which Vettel and Alonso chase in 2nd and 3rd. The rain then increased and the initial lap times proved to be the best. Lewis Hamilton took pole in a car that clearly had more time in it. Vettel takes second on the grid while Nico Rosberg starts in 3rd place. So the rain threw a curveball into todays qualifying and the Mercedes team still came up trumps! Still going to back Lewis for the win! The Mercedes team are still dominant but look is coming up on the rails again? Sebastian Vettel! Reliability will be the key here!